Adchithooku The First Song from Viswasam starring Ajith has gone viral. Home » मनोरंजन » “Adchithooku” The First Song from Viswasam starring Superstar Ajith has gone viral. “Adchithooku” The First Song from Viswasam starring Superstar Ajith has gone viral. The song has garnered unprecedented 4 Million hits and counting. 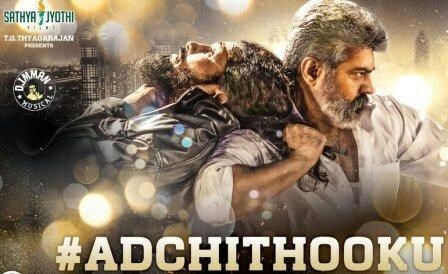 ‘Adchithooku’ is the first song from Ajith starring Viswasam was released yesterday evening. This peppy dance number has been rendered by D Imman, Aditya Gadhavi and Narayanan with lyrics penned by Viveka. Now the song has garnered a massive 4 million hits and real-time views in less than 15 hours of its release, confirms the music company. The song’s video has a very festive vibe to it just like its posters. Ajith is seen in different dance poses and ‘Adchithooku’ could very well be his introduction number. Along with the song, the first look is also out and Ajith will be seen in dual avatars – in salt-and-pepper and fully dyed black look. The project, being bankrolled by Satyajothi Films, features Nayanthara as the leading lady. The project marks the fourth consecutive collaboration of Ajith and Siva. Ajith was last seen playing an Interpol agent in Vivegam, also directed by Siva. Yogi Babu, Thambi Ramaiah and Kovai Sarala are also part of the supporting cast. Viswasam is slated for Pongal 2019 along with Rajini’s Petta. Viswasam is made on a much lesser budget than Vivegam, which was a whopping Rs 120 crore action spectacle. Reporter : “Adchithooku” The First Song from Viswasam starring Superstar Ajith has gone viral. Sidharth Malhotra becomes the First Ever Actor to Endorse a Female Cosmetic Brand For Cause. सोफ़िया हयात ने दी अपने फैन्स को ये खुशखबरी! I Enjoy Doing My Own stunts: Sonu Sood On Not Using ‘Body Double’!